Many of you probably have the odd $2 bill stuck back somewhere or maybe a well wrinkled old Silver Certificate from back in the day and would love to have that $500 Note you have always heard about. A lot of collectors are aware of large denomination currency and are familiar with the well known $500 and $1,000 notes. However, there are a couple of misconceptions about how they were used and just how long the notes have been in use. Most collectors have no idea the first $500 note actually goes back to the Province of North Carolina and was in use as early as 1780! Virginia soon issued a $2,000 note in 1781. Interest bearing notes of as much as $5,000 were issued during the Civil War. In all, there have been almost 20 different series dates and 11 different types of large denomination notes. The 1928 and 1934 series of notes are what most collectors are familiar with seeing. Some were issued as Federal Reserve Notes and others as Gold Certificates. Their denominations were $500, $1,000, $5,000, $10,000 and even a $100,000 denomination! The $100,000 note was solely used by the Federal Reserve and many large notes were intended for bank to bank transactions prior to electronic banking. 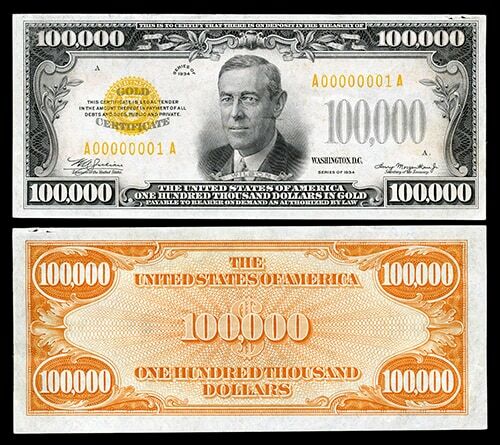 Needless to say, these large denomination notes are no longer in use today. The notes were officially recalled in 1969 and most of them were destroyed or swapped out for other currency. Because of this rarity, if you're lucky enough to run one down, expect prices to be many times the printed value of the note. Regardless of denomination, large denominated notes seem to always hold a certain fascination for collectors everywhere! Varieties vs. Errors, what's the difference? Modern Certified Coins: Is there a substitute for perfection? The New $25 Palladium Eagle! How are new coin designs chosen? Hawaii Federal Reserve Notes, Why?